Buckling is a dangerous phenomenon. It can lead to catastrophic failure of a structure, even if stresses are far smaller than yield limit. You can use linear buckling analysis to verify structural stability. In this post, I will discuss positive aspects and limitations of linear buckling. There is a good reason why linear buckling analysis is simply called “buckling”. It is definitely the most popular approach to buckling problems. 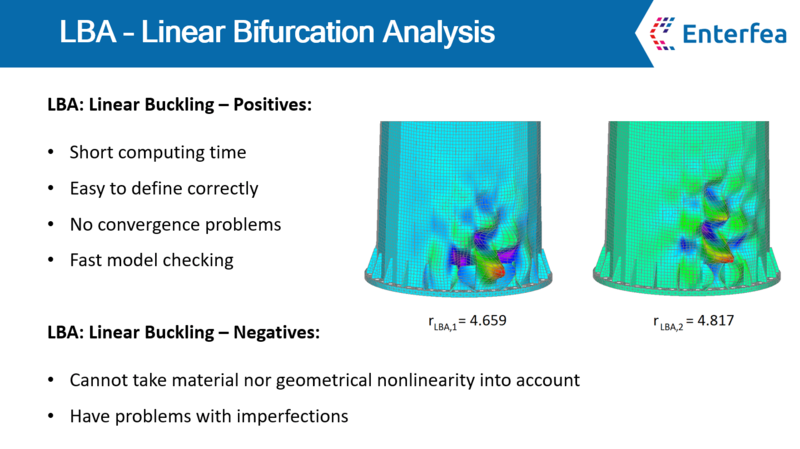 It is so popular that most FEA packages actually call this analysis “buckling” in their preprocessors. Before I go into positive and negative aspects of this analysis, take a look at what you will get as an outcome from it and how to get it. “shape”: you can see on your screen how the model deforms in buckling. Note that this is not an actual deformation. Maximal value of displacement will always be 1.0 (unless you decide to normalize it differently which is possible in some codes). This shape shows you where the stability failure will occur, and how the deformed shape looks like. Most (if not all) solvers by default search for the “lowest” eigenvalues. As an engineer you are of course interested in the lowest multiplier (as it would give the least favorable outcome – lowest capacity). Problem may be in how solver understands what does “lowest” mean. Depending on software, often this means “as close to zero as possible”. This in turn leads to situation where negative values are “allowed”. Negative eigenvalues are usually problematic. They will “revert” loads in the model, which usually is not possible in real problems. It is beneficial to disallow negative outcomes as a rule of thumb. This can be done in many ways depending on the software you use. Some have a switch “only positive values”, some ask for a range in which the outcomes will be searched (use “from 0.00001 to 1000”, and it will be ok). I also encountered programs that do not allow for such setting – analyzing any shell structure in such solver will be a very frustrating task for sure! After first glance you can see that something went wrong – those buckling modes are clearly global in nature. Note that all eigenvalues are negative. This means that solver found a critical load by reversing load that you have applied! Instead of internal pressure, you got underpressure (causing circumferential compression), while in vertical direction shell is in tension instead of compression. This is a solution, but not to the problem you wished to solve! Clearly, the second set of outcomes is correct in this case. Also note, that negative values were “closer” to zero than positive ones, and as such were shown previously. The positive values were also obtained in the first run (eigenvalue 6 was 0.78196). However, if you would like to get first 10 positive ones, you would have to calculate a lot of eigenvalues in this case, and then sort through them – a rather unpleasant task. 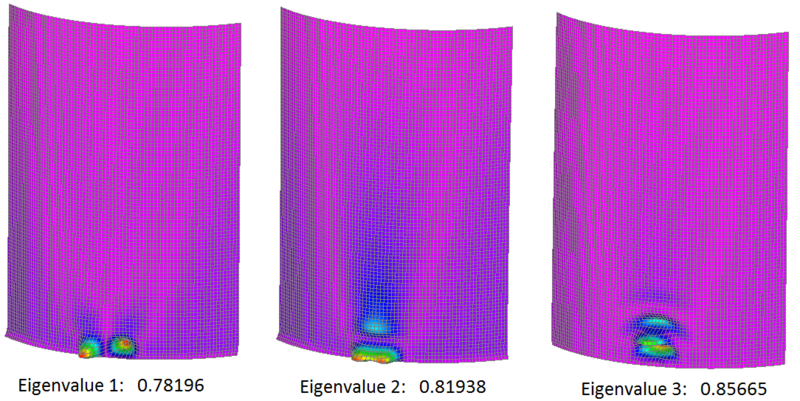 Fast failure check: If linear buckling case gives minimal eigenvalue smaller than 1.0 your model will be unstable without a doubt! This is definitely the fastest way to verify such a case. Imperfection shape: Shape obtained from LBA is often used as imperfection shape. This may not always be desirable, but often is sufficient (especially in beam models). Model verification: You can quickly check if everything “works” in your model. You will see if it behaves as it should, deforms correctly etc. Quick estimate: You can see which regions will have stability issues. You will also get an estimate on how close your model is to stability failure. Of course, this analysis isn’t the final answer to whatever engineering problem you will have. There are some serious limitations involved! Positive outcomes are unreliable: Even if the minimal eigenvalue is higher than 1.0, this doesn’t mean that stability failure won’t happen. This analysis cannot take into account several key factors. LBA is geometrically linear: It cannot take geometric nonlinearity into account. This is a negative factor in most cases, and can greatly reduce capacity. Maybe you have heard that LBA overestimate capacity by 15%. This is often used as a “reference” value, and comes from research made by several scientist in the 80′. Since then however many cases were found where this overestimation is much higher. LBA is materially linear: It cannot take material nonlinearity into account. This may or may not be an issue in the problem you are solving. If the linear analysis shows no yielding, then obviously this won’t be a problem. However if there are places in the model where yield will occur, this may greatly influence stability capacity. “Plastic buckling” also known as “elephant foot buckling” is a known phenomenon in shell design. LBA won’t be able to correctly resolve this and similar issues. LBA have problems with imperfections: In many cases imperfections will lead to serious decrease of model capacity. If you introduce imperfections to linear buckling case, the capacity will decrease as well, but not as much as it should. This is because LBA is geometrically linear, and cannot take into account second order bending and similar effects. I always use this analysis first. Whatever I design in FEA, linear buckling is the first thing I use. The value I get from this analysis is immense because computing time is minimal (when compared to nonlinear buckling). The fact that I can almost instantly check if my model works as intended is incredible. Sometimes nonlinear design takes hours to compute – being able to check the model in several minutes is priceless. You can easily avoid disappointments (when after 10h of computing you get the outcome that shows you forgot to set the last support etc). Also if the eigenvalue is smaller than 1.0 you already know that you need to strengthen the model, there is no need for nonlinear design, which is also a great feat. Just remember this is not a final analysis in my opinion. I’m aware that there are specialists that after tens of years of experience can judge the outcome based on the LBA results (after all things were sent to space with only such design!). However, I prefer to do a nonlinear buckling check anyway. With my Ph.D. in shell stability, I’m aware that there are many issues in stability (especially shell stability) that aren’t known. Many silos failed due to “elephant foot buckling” before this phenomenon got “discovered”. I prefer to analyze everything instead of “discovering” another such phenomenon the hard way. If you want to learn more about FEA start here: free nonlinear FEA course. Thanks Lukasz for another very good post explaining, as usual, in easy to follow ways that “new comers ” to FEA can easily follow. I would like a post to explain when the non linear analysis is necessary with an example to follow the process. There are plenty of examples to come, just be patient with me. I want to keep a 1 post a week speed. For now I want to write few things about stability and numerical design. Have a great day and an awesome new year! Interesting explanation. Couple of comments. By assuming symmetry, the solution space is already constrained to a certain set of eigen values. Be careful about that. Also the positive eigen values appear to be localized events. Changing the mesh might show different eigenvalues. I agree, symmetry restrains some possibilities. This is i.e. why I never do symmetry threw a support (even threw it is possible). I haven’t written about it here however so thank you for pointing this out! Yes the positive eigenvalues are localized – this is a local buckling in a shell, a topic I researched in my PhD. Mesh convergence is quite an interesting phenomenon. I already have made a post about it a while back. Since it included almost the same example (but without internal pressure) if is somewhat relevant to this article as well. You can find the post here. Once more thank you for the insight! Thanks for the article, I have a query. How one could decide if linear static or buckling analysis is to be done for given problem definition? Are there any criteria’s in FEA that would let us know this is the case of buckling analysis? Thanks in advance. Well… if there is any sort of compression in the model buckling is theoretically possible. In bulky, thick models (like a brick) buckling is not really a problem. If you don’t have enough experience to judge if buckling is possible or not… always do the buckling analysis – it is simply a safe option, and analysis itself only takes few minutes! Also, linear static and buckling analysis are two completely different things. It’s not either this or that… you should do both (and far more!) in complex problems.